Susan Brune Eickhoff is no stranger to hard work – and she is the first one to say that it pays off. After working at KPMG for 10 years, Eickhoff was promoted to partner this past October. Those who knew her while at SIUE are not surprised. Even then, Eickhoff dedicated herself to what she loved. “You can do 10 things half way, or give one thing 100 percent of your energy. That's what I do now, and what I did when I was at SIUE,” she says. As a junior, Eickhoff was president of the Accounting Club. It was then that she first met one of the partners at KPMG, who is now her colleague. As partner, Eickhoff shares the responsibility of overseeing the public service practice. This includes monitoring all aspects of professional services available to clients as well as various administrative duties. Eickhoff’s clients include the city of St. Louis and the University of Missouri system. In addition to those duties, Eickhoff is a national instructor for KPMG, which means that she teaches new hires-as well as fellow partners-about KPMG’s business practices. 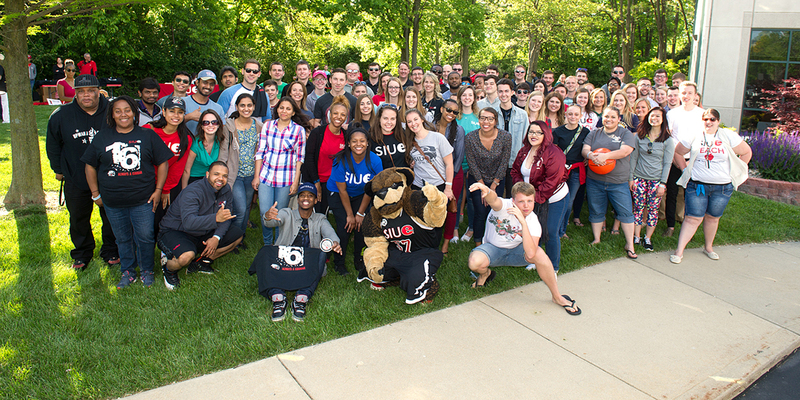 Despite her busy work schedule, Eickhoff remains involved in the SIUE community. She is currently KPMG’s primary recruiter for SIUE and can often be found conducting on-campus interviews. In addition, Eickhoff is a member of the Accounting Advisory Board. One reason Eickhoff says she stays so involved is because she is grateful for the time she spent at SIUE. “While at SIUE, I had two wonderful mentors. Both Tom King and Nancy Starnes played vital roles in my success,” she says. King, who was Chair during Eickhoff’s time at SIUE, was active with Eickhoff while she was working in the Accounting Department. “He gave me great advice and coached me on the path I should take,” explained Eickhoff. Starnes, on the other hand, offered support in other ways. “She often served as a mother figure and helped me in various aspects of life. In fact, she was instrumental in my husband and me getting together.” Susan and her husband, Robert Eickhoff (BSA ’93), were married in 1995. He is also in accounting and currently works as controller and assistant treasurer at Vi-Jon Laboratories. When Eickhoff isn’t working, she enjoys tinkering in the yard of her South St. Louis city home, playing with her daughter, and being active in her daughter’s school. Eickhoff and her husband are expecting their second child this May. Article originally appeared in the 2007 School of Business Accounting Newsletter.